Make sure your protein powder or protein drink passed our test and is right for you! Extra protein can help athletes build muscle and older people prevent muscle loss as part of a resistance- exercise regimen. It can also help maintain blood sugar levels as part of a low-calorie diet. But with so many protein products from which to choose, how do you know which is best? 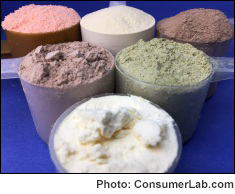 To find out, we tested popular protein powders and drinks made with whey, casein, soy, egg, pea, rice, and/or hemp. The tests revealed problems with 20% of the products selected, including cholesterol in a product that claimed none, and 81% more sodium than listed in another. We also identified many high-quality protein powders. Among these, the cost to get an equivalent serving of protein ranged from just 37 cents to over $5 -- showing how much you can save by comparing products. We selected those that provided the best quality, value and taste as our Top Picks. You must be a member to get the full test results, along with ConsumerLab's recommendations. You'll get results for 24 protein supplements -- 15 selected by ConsumerLab and nine that passed the same testing through our voluntary Quality Certification Program.